Alex Cornish: doing it himself. Alex Cornish is a singer/songwriter based in Edinburgh. His debut album Until TheTraffic Stops was released in 2008 and has received radio airplay on Radio 1, Radio 2 and XFM Scotland. The album was recorded in Alex's home studio and released under his own label, Bellevue Records. He has performed all over the UK and recently supported Alison Moyet on tour. We asked him about the best strategies for getting your music out there. "I come from a musical family, so I started off on classical piano and violin when I was seven years old and saw those instruments through the grades during my teens. I got really interested in the guitar aged about 13 and taught myself, learning mainly blues licks. From the age of 15 I played in bands, through to relatively recently. It was only a few years ago that I began focusing on my own singing and songwriting." "There never has been a single big break - the breaks came as a result of me getting some good material together, recording it on a computer and sending it out there myself. I think there is a big misconception among young bands and artists that you need to be discovered - that a label will turn up at your gig and sign you up. That just doesn't happen in the same way as it used to. "My advice to any upcoming band or artist is to make it happen yourself. Produce songs in your bedroom, put together promo packs and send them off to radio and press. That's what I did, and I was lucky that some people at BBC 6 Music picked it up. From there it was passed up to Radio 2, which led to a session for Dermot O'Leary's show and then on to management/publishing deals." "Some of my ambitions are being fulfilled right now - to be able to play in big concert halls in front of thousands of people is amazing. From here I just want to raise my profile further, sell more records and play bigger venues." What's the best way to build a fanbase? "Make sure you're on Facebook, Twitter, MySpace, Bebo, iLike and so on. You need your own blog/website to enable you to connect with people after a gig - I use Wordpress so I can upload videos, photos and updates from the road. "Then you need to make sure that your material is up to scratch, that you have an image - don't just rock up to gigs in your jeans and a T-shirt - and do as many gigs as you can. You can even put on your own tours and make some money from them." Is it difficult to gain an audience for original material? "Yes, it is. It's harder for people to connect with it, as they have never heard it before, but if you write good songs, things will happen." How often do you sit down to write a new song? Is it a habit, or a massive effort? "I constantly have song ideas going round in my head and use every opportunity to lay something down. I use Logic to record my music, but if I am in a rush and want to make sure I don't forget an idea I will just turn on my laptop, get GarageBand going and use the mic built into the laptop to record the guitar, vocal or piano line. "Writing is definitely habitual, but one of my main problems is not having enough time to see ideas through as they come. For me, the important thing is to make sure all the little ideas are effectively jotted down on my laptop so that when I do have time to work on them I can develop them into songs." "I have a Mac G5, Logic Pro, an AKG mic, an audio interface, a Line 6 POD, a Yamaha digital piano, and that's pretty much it. That's really all I need to put together good recordings. "I never attempt to record drums myself - I go to a studio to do that. I also rarely record vocals using my own mic; I will either hire a Neumann or record the vocal in a studio. The vocals on my album, Until the Traffic Stops, were recorded at home using a hired Neumann." How many albums have you sold, and what selling methods would you recommend? "I've sold about 4,000 copies, which is great for a very DIY effort. The main thing that's so good right now is that in terms of distribution, independent artists are on a level playing field with major labels. It has never been easier to get your music out there. I have used TuneCore - a very cheap and easy service - to get on iTunes, Napster and so on. Then you have Amazon - you can set up an account with them, and they will take stock of physical copies of your releases. You should also sell through your website, and an easy way to do this is to set up an account and use the instructions to create PayPal buttons on your page. "Finally, there is physical distribution to record shops. There's really only one major record shop left now (sadly), which is HMV (which in turn owns Fopp), and to get your CDs stocked there you're going to need a distribution deal. I have a deal with Shellshock, who are fantastic." Why did you set up your own label rather than chasing a deal with an established one? "For years I was sending out demos, doing showcases and trying to get a deal through the usual channels. It wasn't getting me anywhere, so I decided to just do an album and put it out there myself. The reaction I got really surpassed my expectations and, in fact, I was invited to do things that often many major-label artists don't get to do. "The record industry has changed dramatically in the last few years, and now it is possibly wiser to get investment from sources other than the traditional label route. If you have a manager that knows the business, someone with some cash, perhaps a publisher, and you set up a little team around you, you can go far. Whether you can achieve massive worldwide sales this way has yet to be seen, because no independent artist has done that yet, but watch this space - if it isn't me, readers, it could be you! Get your stuff out there and make it happen. 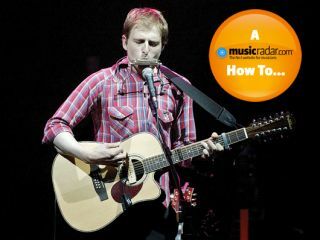 The Radio 1 OneMusic website has some great tips, as does the Tom Robinson site." How did you land the Alison Moyet gig? "Me and my manager are always on the lookout for good support slots, and he contacted Alison's manager. I was put on a shortlist of potential acts, and Alison picked me. My advice for any upcoming artists would be to contact their local promoters - lots of fairly well-known acts tour without a support act and just have local bands support them. I supported Starsailor recently - I emailed the promoter, and they gave me the gig. It can be simple, but expect lots of knockbacks to begin with. For every 100 things I try, one thing will come off. Just keep going." Is life on the road as glamorous as it's cracked up to be? "Well, just the other day we were sleeping in the van on a caravan park in North Wales. It had been snowing, and a gale was blowing. The tour van is very small and doesn't have a toilet. It was a day off, and we had headed into town and got drunk. As I had to sing the next day, I drank loads of water before heading back to the van. At about 2am I woke up dying for the toilet, climbed over the guy who plays piano for me and out of the door and stood in the sleet and wind up on a hill in the pitch black, in my pants, having the longest wee I have ever had. It was very unpleasant." Any tips for aspiring singer/songwriters? "Work hard, write good songs, record them to the best of your ability and use the tools that are available to us now to get it out there. If you do that, good things will come, I promise you." Dream of a career as a singer/songwriter? Get the brand-new Computer Music Special: How To Make It In Music, out now, to find out how to make it a reality.